We knew this handsome guy wouldn’t be around for long! It was love at first sight when Hendrix’s family saw him. They knew he’d be a great match for their active young Siberian. 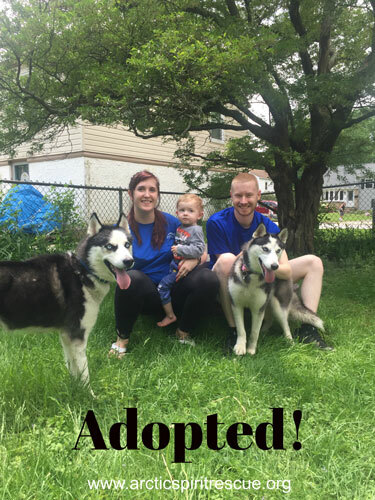 This Sibe experienced family was aware that this breed often does better while with others of the same mindset and this pair was no exception. 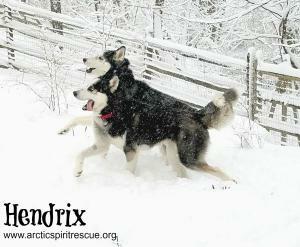 Hendrix now has a boy of his own to grow up with and a very pretty Siberian sister to hang out with. Congratulations to all and welcome to the ASR family! Hendrix is a blue-eyed, black and white youngster with a loving heart and a toddler’s mischief. He is approximately 1 year young, and was found as a stray before making his way to a local shelter. He loves to play with other dogs, loves the snow, and still isn’t sure where those snowballs went when they landed. He chases the tennis ball on the ground, but doesn’t know where it went when thrown up in the air! He’s still a naive puppy who will greatly benefit from consistency and patience. Typical Husky, he looks for things to do when bored, and frequently finds them (whether you want him to or not). He’s pretty sure he’s a lap dog, and is not graceful or shy about it. If anything is happening, expect him to be front and center and very enthused. He’s still learning mouth manners but is not aggressive. He’s happy to steal treats from his fur siblings but is easily put in his place by the other dogs. He will do best with another canine sibling of similar size and energy level. No small dogs, cats, or other small animals, please. Hendrix behaves well in the crate, which is where he should be kept when not supervised. He came to us with no house training but is quickly learning. 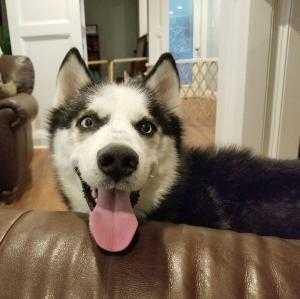 He is a typical Husky counter surfer and he still jumps up on people so he would be better with children over age 7 or 8 that he won’t knock down accidentally, He seems to enjoy children as well as any human attention he can get. He would love a fenced yard to run and play in. Hendrix is Lyme positive and has almost completed his antibiotic. With regular veterinary care, this should not be detrimental to his future. Hendrix is quickly becoming a favorite and charms everyone he meets. Are you up for the young Siberian challenge? Hendrix was adopted, but we still have other dogs that need homes! 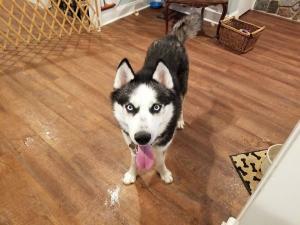 Check out some other dogs available for adoption!